A conversation between police in the UK and FBI agents in the US has been hacked and posted online by the Anonymous hacking collective today. 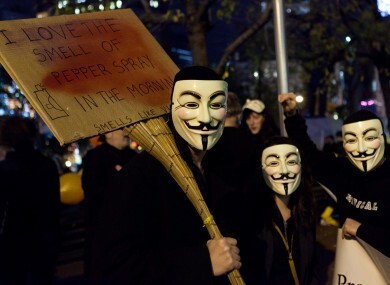 The Guy Fawkes mask has come to symbolise the Anonymous hacking movement. A CONFERENCE CALL between officials from the FBI and London’s Metropolitan Police that was hacked and published online today discloses details of intelligence sharing with Irish authorities. The call was published on YouTube today after members of the Anonymous hacking group said they had hacked into an FBI agent’s email account and accessed details of the call and when it was to take place – details that have also been published online. Police in the UK have said that the hacking of the conference call on 17 January poses no risk to operations ‘at this stage’. The FBI said the information “was intended for law enforcement officers only and was illegally obtained” adding that a criminal investigation is underway. The loosely-defined hacking collective Anonymous published a roughly 16-minute-long recording of a conference call apparently devoted to tracking and prosecuting members of the loosely-knit group. It also published the email purportedly sent by an FBI agent to international law enforcement agencies in UK, Ireland, the Netherlands, Sweden and France which invites them to “discuss the ongoing investigations related to Anonymous … and other associated splinter groups.” The email contained a phone number and password for accessing the call. In recent weeks the Swedish branch of Anonymous has claimed to have conducted cyber attacks on the websites of the Departments of Justice and Finance, forcing them to be temporarily taken offline. This week, the group claimed it had accessed website passwords of a number of Irish government employees and officials, and posted them online. The attacks were in response to plans by the government to introduce a statutory instrument into Ireland’s online copyright legislation which has led to fears that it could potentially restrict internet freedoms. As many as 80,000 people have signed an online petition against the plans – dubbed ‘SOPA Ireland’ – but the Sherlock this week insisted that wording of the controversial statutory instrument reinforcing online copyright laws will not be changed. Following a spate of arrests across the world, the group and its various offshoots have focused their attention on law enforcement agencies in general and the FBI in particular, AP reports. Email “Hacked FBI-Met Police call refers to intelligence sharing with Irish authorities ”. Feedback on “Hacked FBI-Met Police call refers to intelligence sharing with Irish authorities ”.